Environmental watering is sustaining the habitat necessary for the survival of one of Australia's most threatened fish, the Murray hardyhead. Lake Elizabeth was once a freshwater wetland, but land-use change and water management have caused salinity to increase. Fortunately for Murray hardyhead, they can tolerate very high salinity, which gives them an advantage over other fish in salty wetlands. Before the Millennium drought, Lake Elizabeth north-west of Kerang, had a vibrant population of Murray hardyhead: there are currently only 10 populations recorded in Australia. During the Millennium drought, the lake dried out and all its Murray hardyhead died. In recent years, North Central Catchment Management Authority (CMA) has undertaken a rehabilitation program at Lake Elizabeth to make water quality, habitat and food at Lake Elizabeth suitable for the reintroduction of Murray hardyhead. This enabled 50 fish to be translocated to it in 2016. Environmental watering keeps the salinity in Lake Elizabeth between 25,000 and 40,000 EC (electrical conductivity in micro siemens or µS/cm), which is roughly half as salty as the sea. This is helpful for Murray hardyhead because it excludes less salt-tolerant fish that prey on them or compete with them for food, such as carp, redfin and gambusia. The salinity range is also good for sea tassel, an aquatic plant that provides habitat for Murray hardyhead to reproduce, and for some zooplankton, small crustaceans which are the ideal food source for small fish1. Aquatic plant surveys show dramatic improvements in Lake Elizabeth since the first environmental watering in 2014. Plants such as stonewort, sea tassel and watermat have re-established and now cover about 80% of the lake bed2. There is now sufficient habitat for Murray hardyhead to spawn. The abundance and diversity of zooplankton was assessed in Lake Elizabeth in 20153 and 20164 to determine the availability of food for Murray hardyhead. The results were compared to nearby Round Lake, a favoured habitat of Murray hardyhead. Zooplankton is more abundant at Lake Elizabeth than Round Lake, indicating that the lake has enough food for the newly-introduced population to establish. The additional food available also benefits birds and there has been a 36 percent increase in wetland bird species diversity since environmental watering began at Lake Elizabeth2. In this establishment phase, North Central CMA does regular monitoring to ensure that environmental watering achieves the best possible water quality, food and habitat for Murray hardyhead, as Figure 1 below shows. The salinity of Lake Elizabeth is managed by adding environmental water6. As the water level drops, the lake receives more saline groundwater resulting in a rise in salinity, monitored be electrical conductivity measurements. Waterway managers have reduced the intrusion of groundwater by delivering environmental water when water levels drop. The viability of the ecosystem depends on keeping electrical conductivity below 40,000 EC and preferably between 25,000-35,000 EC. 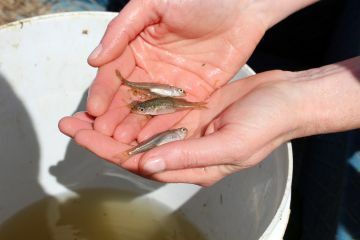 While the success of the Murray hardyhead translocation program will be determined through ongoing surveys, the lake has been primed by environmental watering to provide another valuable niche for this threatened species5. 1 G. Backhouse, J. Lyon, B. Cant, 2008a, National Recovery Plan for the Murray Hardyhead Craterocephalus fluviatilis. Department of Sustainability and Environment, Melbourne. 2 Aquatic vegetation survey of Lake Elizabeth, April 2015, Rakali Ecological Consulting, unpublished client report. 3 I. Ellis and R. Petrie, 2015, Zooplankton in Lake Elizabeth, winter 2015: identifying food resource availability for future translocated Murray hardyhead, Final report prepared for the North Central CMA by The Murray-Darling Freshwater Research Centre, MDFRC publication 79/2015, June 8, 8 pp. 4 R. Petrie, 2016, Zooplankton in Lake Elizabeth, Round Lake and Woorinen North Lake, winter 2016: identifying food resource availability for Murray hardyhead. Draft Report prepared for the Department of Environment, Land, Water and Planning by the Murray-Darling Freshwater Research Centre, MDFRC publication 111/2016, May, 7pp. 5 I. M. Ellis, D. Stoessel, M. P. Hammer, S. D. Wedderburn, L. Suitor & A. Hall, 2013, Conservation of an inauspicious endangered freshwater fish, Murray hardyhead (Craterocephalus fluviatilis), during drought and competing water demands in the Murray-Darling Basin, Australia. Marine and Freshwater Research, 64(9), 792-806. 6 Lake Elizabeth hydrogeology, salt and water balance and adaptive management summary, North Central CMA, unpublished.